So this morning, I was supposed to go off to Bible study, and enjoy 2 hours of kid-free adult discussion about things that aren't Dora the Explorer and Disney and then follow it by a fellowship at a friend's house with my kids where she was making lunch for the entire group (read:free lunch and nice people). Well, Ellie- in an obvious maneuver to ruin my life- has had a runny nose for 3 days and despite my hopes that I would wake to a miraculous healing (how "New Testament" of me) it dawned on me 20 minutes before we left that she was still snotty and likely contagious. And compelled more by what other people would think of me than genuine concern for others (I'm not proud of it, I just rrrrrrreally wanted to go) I decided I had to stay home. But I'm so mature that I handled it perfectly and went about our normal daily routine without a hitch...well, that's what I'd like to be telling you right now...but I'd be breaking a commandment if I said that (and frankly, you wouldn't have a very exciting post to read). Nope, I threw a temper tantrum. You might wonder what an adult temper tantrum looks like and I would submit to you that it's not all too different from a child's tantrum. I cried, I pouted, I complained to my husband so he'd feel bad about how hard my life as a mom is, and then I told God he was mean (in so many words, I'd never say it that plainly). I announce to the kids that we're going for a drive (in my head carefully calculating where our "drive" should be to coincidentally pass by the local drive-thru coffee spot, and off we go. We were in the car about 3 minutes, listening to "Adventures in Odyssey" which is a christian radio program of stories for kids when I realized (sigh) God was going to teach me something. The story was all about trusting God. About a little boy who had been wanting to audition for the chamber choir, and had been praying about it, when a series of events that were unjust and out of his control led to him not being able to. The moral of the story was that we must trust God even when our circumstances seem like they're going the opposite way we'd been asking or wanting. Because to trust him only conditionally when we get the right things, or to trust him to provide exactly what we ask him for, isn't really trust at all. (I know, you guys already knew this, you're smart). And in that moment, I realize, I can trust him. It doesn't have to look like I think it should. He is able to give me the strength to run and not grow weary when I trust him. He is more than I dared hope in sufficiency, grace and love, and he pursues me. He loves me when I'm stupid, when I'm mad, when I'm foolish and stubborn. He loves me when I'm pouty, rebellious and angry. He loves me enough to tell me so, even though I could never earn it. And he is interested in my life. It's enough when you experience something like that to soften even the hardest of hearts, and melt even the most stubborn walls. Now, maybe this is coincidence, by chance it all happened in some cosmic scale dice toss. Maybe it's science, and all the protonuclematrons in the universe lined up to zap the eagle over my car at that exact moment. Maybe it's...buddah, or a reincarnate mind reader who is currently in his eagle life stage and new I needed to see one. But it's not. It's a real and living God interacting with a daughter that he loves enough to pursue. It's a God looking down from the heavens where he sits enthroned, seeing his tiny speck of a daughter in Fort Collins Colorado throwing a temper tantrum. And then choosing to not only put on a story on her radio at the exact moment that she needed to hear about trusting in his plans, but then also making a bald eagle fly over her car and causing her to look up and notice, and then reminding her of the song she had to memorize for a video shoot 3 years earlier with Isaiah 40:31 in it. 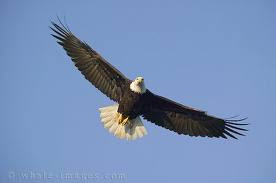 (and no matter how common eagles are--in 28 years of living the only place I've ever seen one is a zoo). Who can do that but God? Who would do that but God? Cynics will scoff. Scientists will explain. Atheists will ignore. But I can tell you this much, there were 3 people in that car today, that had a very real experience with the God of the entire creation and all time, stooping to give his pouty, sinful little daughter a kiss on the cheek and a reminder of his love. And that's enough for me. I appreciate the topics you write about and the transparency you have with your attitudes and reactions. It's refreshing in a "blog world" where ironically everyone's life is abnormally perfect! And I say that, only being guilty of portraying that myself!